It’s an issue that many hospitals, from academic medical centers to regional community hospitals, are facing. Several factors are driving demand, such as a larger patient population, including seniors, ending up in the ICU as people live longer and treatment improves. 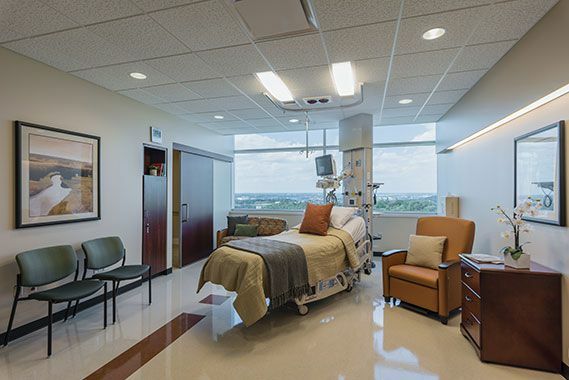 “We’re seeing patients, stroke and heart attack victims especially, who would have died in the past now surviving the initial attack and needing critical care to recover,” says Angela Mazzi, senior associate at GBBN Architects (Cincinnati). Others are deferring medical care for economic reasons or seeking initial treatment in an outpatient setting, so when they do arrive at the hospital, they’re in greater need of critical services, says Andy Lane, associate vice president at CallisonRTKL (Chicago). He says these issues could change further with the new administration, if new rules on penalties for readmission or reimbursements push hospitals to adapt their approach to inpatient care. But for now, when patients do show up, they’re a lot sicker than they used to be,” Lane says.